Yet nowhere along the line has any OBA MP, Senator or OBA Executive condemned these hateful and racist words. “Once it was announced that the House would sit today, police initiated positive action to open a path to the House. Officers approached the protestors that were blocking access, warned them that they were committing offences, and instructed them to desist. These comments are interesting as his compressed timeline does not match the reality captured on photograph or video. 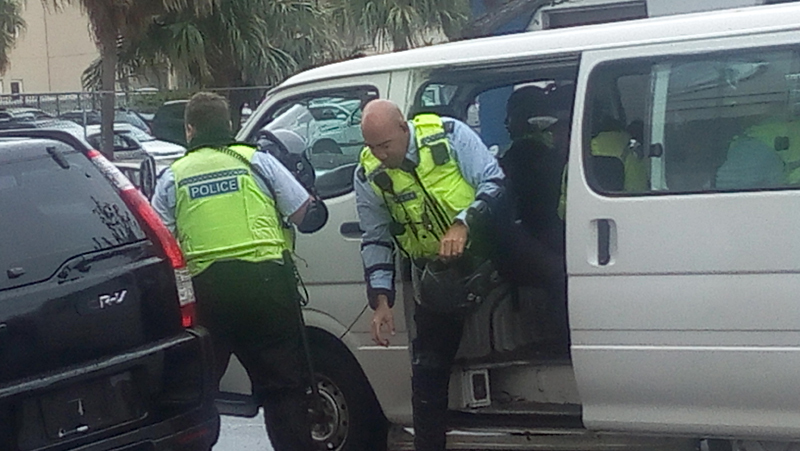 In photograph 1, taken at 12:35 pm police officers in protective gear come out of a police vehicle and enter Hamilton Police Station. This clearly shows premeditated intent to deploy these officers at least 1-2 hours before they actually appeared on Parliament Street. In photograph 2, taken at 12:45, a group join the persons along Parliament Street. Does it appear as if they are violent? In photograph 3, we see a group of police officers commanded by Inspector Mark Clarke standing in front of a peaceful crowd. In the above video small contingent of Police, led by Inspector Mark Clarke, stand in front of the peaceful crowd. For a while they maintain their position and there is no evidence of any Police Officer being assaulted. Does the COP considers singing “We shall not be moved” as an assault on an officer. At time line 3:10 we see the Police Officers barrel into the peaceful crowd. Not once did they take a second to say that they were there to arrest anyone. 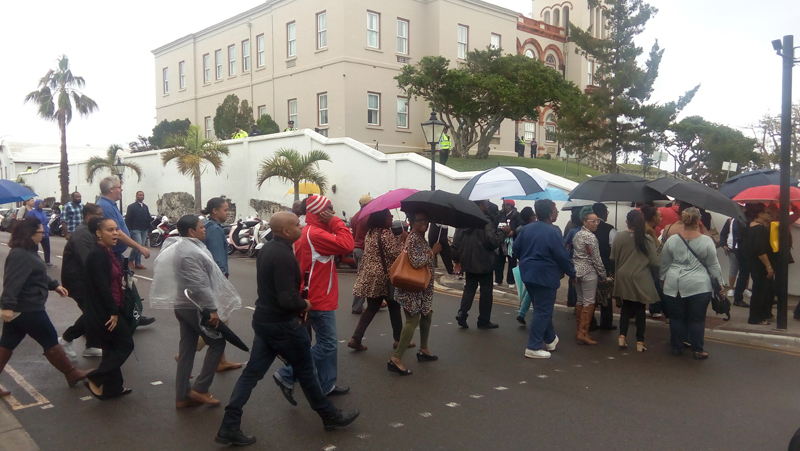 What is very important to note that what is most telling is that the Commissioner never mentioned that after their first line of approach failed, the Police Officers formed up and then ran from Parliament Street to Reid Street. It is on Reid Street where officers deployed pepper spray from behind a wall whilst heavily armed police officers corralled the people, mostly women, against the southern wall of Sessions House. 1. Why were Police Officers ordered to don protective gear after 12 pm when the small crowd was peacefully huddled in the rain? 2. Where is the evidence of police being assaulted prior to the Police Support Unit officers being deployed? 3. Why would Police Officers who were safely behind a wall deploy pepper spray? Was not the wall separation enough? 4. According to the regulations regarding use of pepper spray the officer[s] who discharge the pepper spray are supposed to render first aid to the person[s] who have been sprayed. 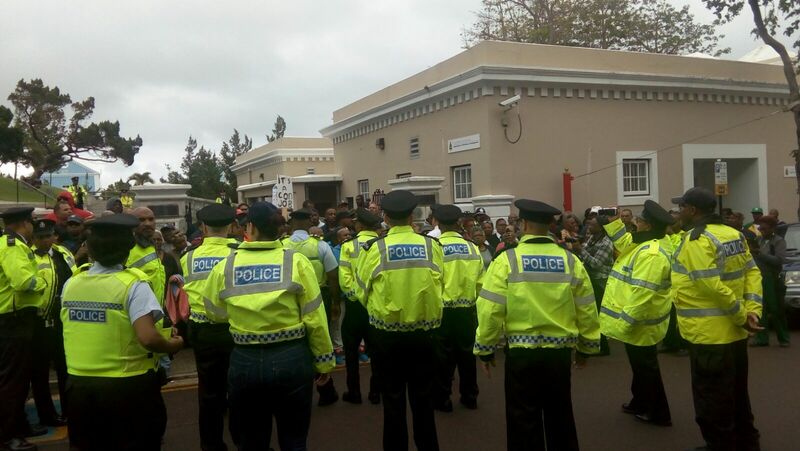 Why did these officers render no assistance to Bermudians, mostly women, who were pepper sprayed? The Premier of the country called this Police action “violence against our citizens.” What exactly does the Commissioner call it? In response, the Commissioner of Police Michael DeSilva said, “While we appreciate this is just an opinion piece, we would like to clarify a few things, albeit we have already answered these questions in the media. “The police have explained the difference between peaceful protest and unlawful behaviour. Those persons who were physically blocking the gates were committing offences under the Parliament Act and the Summary Offences Act by not allowing Ministers and Members of Parliament to enter. “This was clarified by the Centre for Justice on 3rd December. After hours of warning those persons to stop blocking the gates, the police attempted to make arrests and some officers were assaulted. “Protective helmets were ordered as a precautionary safety measure for another group of officers who attempted to make arrests, but they were also assaulted. A number of files have been submitted to the DPP to consider criminal charges in this regard. “We have also explained that no single order was given to deploy captor spray, and none was required. Captor spray was not used to clear people away from the gates: it was used by officers who were directly assaulted or felt threatened by some of the protestors. “Aftercare, which involves rinsing the eyes with fresh water, was performed by police officers at the scene on several persons who were affected by the spray. “The police appreciate the public would like to know more about the events of the 2nd December. These matters are currently under independent review by a senior UK officer, as well as being considered by the Police Complaints Authority and possibly the courts. 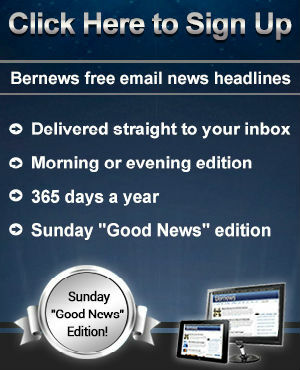 I’m very grateful to Bernews for getting a response to this column and not running it alone. Mr Famous has written other so called opinions which have been nothing more than propaganda. It is good to have balance. 1. Inform someone they are in breach of the law – video of that from early morning when Bob Richards tried entering the grounds and couldn’t. 2. If they fail to adhere to police instructions, then issue order/warning that if they do not desist, they will be arrested – video of that when Insp Clarke is talking to the PLP leadership and Union Reps, on the front holding hands. 3. If this fails, then police are authorised to use force, as required, to acheive the objective, usually to effect an arrest. Unfortunatley they didn’t arrest the 100 people there, but based on the events of the day, it appears the purpose was to open Parliament, not make arrests. I’m sure if it was OBA blocking the PLP you would be writing about why none of the protestors were arrested, and surely has to do with race… But I won’t judge based on your past columns. People breaking the law were lawfully dispersed. The lawbreakers, did in fact get what they deserved, that’s not a racist comment. Why is he calling out Inspector Mark Clarke only? Christopher Famous only defames to keep his miscommunication and heightened contradictions going to feed the mindset of those who need to keep the agenda open of over throwing the Government.